In the United States, the Recording Industry Association of America (RIAA) awards certification based on the number of albums and singles sold through retail and other ancillary markets. Other countries have similar awards (see music recording sales certification). Certification is not automatic; for an award to be made, the record label must request certification. The audit is conducted against net shipments after returns (most often an artist's royalty statement is used), which includes albums sold directly to retailers and one-stops, direct-to-consumer sales (music clubs and mail order) and other outlets. 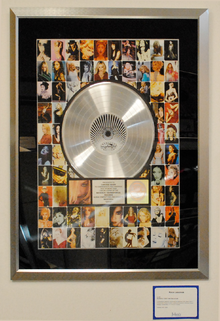 A platinum award for the album GHV2 of Madonna. A Gold record is a single or album that managed to sell 500,000 units (records, tapes or compact discs). The award was launched in 1958; originally, the requirement for a Gold single was one million units sold and a Gold album represented $1 million in sales (at wholesale value, around a third of the list price). In 1975, the additional requirement of 500,000 units sold was added for Gold albums. Reflecting growth in record sales, the Platinum award was added in 1976, for albums able to sell one million units, and singles selling two million units. The Multi-Platinum award was introduced in 1984, signifying multiple Platinum levels of albums and singles. In 1989, the sales thresholds for singles were reduced to 500,000 for Gold and 1,000,000 for Platinum, reflecting a decrease in sales of singles. In 1992, RIAA began counting each disc in a multi-disc set as one unit toward certification. Reflecting additional growth in music sales, the Diamond award was instituted in 1999 for albums or singles selling ten million units. Because of these changes in criteria, the sales level associated with a particular award depends on when the award was made. Nielsen SoundScan figures are not used in RIAA certification; the RIAA system predates Nielsen SoundScan and includes sales outlets Nielsen misses. Prior to Nielsen SoundScan, RIAA certification was the only audited and verifiable system for tracking music sales in the U.S.; it is still the only system capable of tracking 100% of sales (albeit as shipments less returns, not actual sales like Nielsen SoundScan). This system has allowed, at times, for record labels to promote an album as Gold or Platinum simply based on large shipments. For instance, in 1978 the Sgt. Pepper's Lonely Hearts Club Band soundtrack shipped Platinum but was a sales bust, with two million returns. Similarly, all four solo albums by the members of Kiss simultaneously shipped Platinum that same year but did not reach the top 20 of the Billboard 200 album chart. The following year, the RIAA began requiring 120 days from the release date before recordings were eligible for certification, although that requirement has been reduced over the years and currently stands at 30 days. Sony was widely criticized in 1995 for hyping Michael Jackson's double album HIStory as five times Platinum, based on shipments of 2.5 million and using the RIAA's recently adopted practice of counting each disc toward certification, while SoundScan was reporting only 1.3 million copies sold. A similar discrepancy between shipments and sales was reported with The Lion King soundtrack. For further information, see Music recording sales certification. Multi-disc albums are counted once for each disc within the album if it is over 100 minutes in length or is from the vinyl era. For example, The Smashing Pumpkins's Mellon Collie and the Infinite Sadness (running time of 121:39) and OutKast's Speakerboxxx/The Love Below (running time of 134:56), both double albums, were counted twice, meaning each album was certified diamond after 5 million copies were shipped. Pink Floyd's The Wall and The Beatles' White Album, both vinyl-era, are also counted double even though their running times are under the minimum requirement. Rules may or may not apply depending on most recent staff within the Distributions position. Since 2000, the RIAA also awards Los Premios de Oro y De Platino (Gold and Platinum Awards in Spanish) to Latin albums which are defined by the RIAA as a type of product that features at least 51% of content in Spanish. Note: The number of sales required to qualify for Oro and Platino awards was higher prior to January 1, 2008. The thresholds were 100,000 units (Oro) and 200,000 units (Platino). All Spanish-language albums certified prior to 2008 were updated to match the current certification at the time. "La Bomba" by Bolivian group Azul Azul is the only single to receive a Latin certification based on shipments before the creation of the Latin digital singles awards in 2013. The Disco de Diamante award was introduced after the RIAA updated the thresholds for Latin certifications in December 20, 2013. The Disco de Diamante is awarded to Latin albums that have been certified 10× Platinum. Note: The number of sales required to qualify for Gold and Platinum discs was higher prior to January 1, 1989. The thresholds were previously 1,000,000 units (Gold) and 2,000,000 units (Platinum). From 2004 through July 2006, the certification level was 100,000 downloads for Gold and 200,000 for Platinum. When the RIAA changed the certification standards to match retail distribution in August 2006, all Platinum and Multi-Platinum awards for a digital release were withdrawn. Gold certifications, however, were not, meaning a song that was downloaded over 100,000 times and certified so by the RIAA during that time frame retains its Gold status. Starting May 9, 2013, RIAA certifications for singles in the "digital" category include on-demand audio and/or video song streams in addition to downloads at a rate of 100 streams=1 certification "unit". On January 2, 2016, this rate was updated to 150 streams = 1 certification unit. The Latin Digital Single Awards began on December 20, 2013. As with the digital sales, 100 streams count as one download sale. Along with albums, digital albums, and singles there is another classification of music release called "Video Longform." This release format includes DVD and VHS releases, and certain live albums and compilation albums. The certification criteria are slightly different from other styles. The video box set (or "Multi-Box Music Video Set") award is a classification for video compilations that include three or more videos that are grouped and marketed together as a set. Like Video Longform, this includes DVD and VHS releases and the certification criteria is the same. Each individual video within set is counted as one toward certification. The best-selling video box set as certified by the RIAA is The Rolling Stones' Four Flicks DVD compilation from their Licks World Tour, with a 19X Multi-Platinum designation. This was likely achieved due to exclusive distribution rights owned by Best Buy by their short-lived music production company, Redline Entertainment. Singles that have been certified Gold might receive additional certifications for achieving Platinum and Multi-Platinum levels. For example, Eminem has had 13 singles certified Gold, 8 of which went on to achieve Platinum certification as well. This list includes the RIAA formats 'Single','12 inch single' and 'Video Single'. This list includes singles of the RIAA types 'standard' and 'digital'. 12 inch singles were given a Gold certification after sales of 500,000 or more copies sold. This took place back when more 12-inch singles were manufactured and sold. This table tracks artists with some number of singles that have received at least twenty total certifications. ^ "Apply - RIAA". RIAA.com. Retrieved 2016-01-23. ^ a b "History Of The Awards". RIAA.com. Archived from the original on July 1, 2007. ^ a b c Adam White (1990). The Billboard Book of Gold & Platinum Records. Billboard Books. p. viii. ISBN 978-0711921962. ^ Grein, Paul (Nov 30, 2012). "Chart Watch Extra: Where "Thriller" Ranks". Chart Watch. Yahoo Music. Retrieved December 5, 2012. ^ Adam White (1990). The Billboard Book of Gold & Platinum Records. Billboard Books. p. 3. ISBN 978-0711921962. ^ Lendt, C.K. (1997). Kiss and Sell: The Making of a Supergroup. p. 95. ^ Farber, Jim (1995-09-11). "Don't Buy into Jax' Pyramid Scheme: Platinum-Status Symbol on 'History' Marking Over 5-million Albums Sold Proves to Be as Worthless as Fool's Gold". Daily News. New York. Retrieved 2011-08-05. ^ Philips, Chuck (January 15, 1995). "Sold, Shipped, What's the Diff? : About 2 million albums, in the case of 'The Lion King,' pointing up the disparity between industry's sales tally and SoundScan's". Los Angeles Times. p. 67. Retrieved June 24, 2012. ^ "About". Recording Industry Association of America. Retrieved August 12, 2015. ^ a b c Lamy, Jonathon (February 14, 2008). "Country Takes The Crop". RIAA. Archived from the original on November 2, 2013. Retrieved July 11, 2011. ^ "RIAA Launches 'Los Premios de Oro y De Platino' to Recognize Top Latin Artists" (Press release). RIAA. January 25, 2000. Archived from the original on July 15, 2011. Retrieved February 15, 2011. ^ Cobo, Leila (August 18, 2001). "Latin Notas". Billboard. Prometheus Global Media. 113 (33): 32. Retrieved April 11, 2014. ^ a b "Diamante Awards". RIAA. Retrieved January 30, 2015. ^ "History of the Awards". RIAA. Archived from the original on July 1, 2007. Retrieved January 20, 2015. ^ Grein, Paul (May 14, 1989). "New Golden Rule: 500,000 Sales Mark for All Singles". Los Angeles Times. Retrieved 12 November 2010. ^ "NEW "COMBINED" DIGITAL SINGLE AWARD". Recording Industry Association of America. May 9, 2013. Retrieved May 10, 2013. ^ "RIAA and GR&F Certification Audit Requirements: RIAA Digital Single Award" (PDF). Recording Industry Association of America. January 2, 2016. ^ "About the Awards - RIAA". RIAA. Retrieved 2018-08-16. ^ Inc, Nielsen Business Media (2003-10-18). Billboard. Nielsen Business Media, Inc.
^ "Gold & Platinum - RIAA". RIAA. Retrieved 2018-08-16. ^ a b c d e f g h i j k l m n o p q r s t u v w x y z aa ab ac ad ae af ag ah ai aj ak al am an ao ap aq ar as at au av aw ax ay az ba bb bc bd be bf bg bh bi bj bk bl bm bn bo bp "Gold & Platinum: Artist Tallies". Recording Industry Association of America. Retrieved January 5, 2016. ^ "RIAA Gold and Platinum Search for singles by Eminem". Riaa.com. Retrieved 2016-06-20. ^ "RIAA Gold and Platinum Search for Adele". Riaa.com. Retrieved 2017-05-25. ^ "RIAA Gold and Platinum Search for singles by Elvis Presley". Riaa.com. Retrieved 2011-08-05. ^ "RIAA Gold and Platinum Search for singles by Rihanna". Riaa.com. Retrieved 2011-08-05. ^ "RIAA Gold and Platinum Search for Singles by Katy Perry". Riaa.com. Retrieved 2015-11-18. ^ "RIAA Gold and Platinum Search for singles by Lil Wayne". Riaa.com. Retrieved 2011-08-05. ^ "RIAA Gold and Platinum Search for singles by Mariah Carey". Riaa.com. Retrieved 2011-08-05. ^ "RIAA Gold and Platinum Search for singles by Taylor Swift". Riaa.com. Retrieved 2011-08-05. ^ "RIAA Gold and Platinum Search for singles by Madonna". Riaa.com. Retrieved 2011-08-05. ^ "RIAA Tallies The Decade's Top Gold & Platinum Award Winners". Retrieved September 17, 2011. ^ "RIAA Gold and Platinum Search for singles by Beyoncé". Riaa.com. Retrieved 2011-08-05. ^ "RIAA Gold and Platinum Search for singles by The Beatles". Riaa.com. Retrieved 2011-08-05. ^ "RIAA Gold and Platinum Search for singles by Michael Jackson". Riaa.com. Retrieved 2011-08-05. ^ "RIAA Gold and Platinum Search for singles by Whitney Houston". Riaa.com. Retrieved 2011-08-05. ^ "RIAA Gold and Platinum Search for singles by Janet Jackson". Riaa.com. Retrieved 2011-08-05. ^ "RIAA Gold and Platinum Search for singles by Elton John". Riaa.com. Retrieved 2011-08-05. ^ "RIAA Gold and Platinum Search for singles by Lady Gaga". Riaa.com. Retrieved 2011-08-05. ^ "RIAA Gold and Platinum Search for singles by Bruno Mars". Riaa.com. Retrieved 2011-08-05. ^ "RIAA Gold and Platinum Search for singles by Kanye West". Riaa.com. Retrieved 2011-08-05. ^ "RIAA Gold and Platinum Search for singles by R. Kelly". Riaa.com. Retrieved 2011-08-05. ^ "RIAA Gold and Platinum Search for singles by Usher". Riaa.com. Retrieved 2011-08-05. ^ "RIAA Gold and Platinum Search for singles by Chris Brown". Riaa.com. Retrieved 2011-08-05. ^ "RIAA Gold and Platinum Search for singles by T.I". Riaa.com. Retrieved 2012-08-05. ^ "RIAA Gold and Platinum Search for singles by Jay-Z". Riaa.com. Retrieved 2011-08-05. ^ "RIAA Gold and Platinum Search for singles by Linkin Park". Riaa.com. Retrieved 2011-08-05. ^ "RIAA Gold and Platinum Search for singles by Black Eyed Peas". Riaa.com. Retrieved 2011-08-05. ^ "RIAA Gold and Platinum Search for singles by Ariana Grande". Riaa.com. Retrieved 2016-10-24. ^ "RIAA Gold and Platinum Search for singles by Aretha Franklin". Riaa.com. Retrieved 2011-08-05. ^ "RIAA Gold and Platinum Search for singles by Ludacris". Riaa.com. Retrieved 2011-08-05. ^ "RIAA Gold and Platinum Search for singles by Kenny Chesney". Riaa.com. Retrieved 2011-08-05. ^ "RIAA Gold and Platinum Search for singles by Flo Rida". Riaa.com. Retrieved 2011-08-05. ^ "RIAA Gold and Platinum Search for singles by Brad Paisley". Riaa.com. Retrieved 2011-08-05. ^ "RIAA Gold and Platinum Search for singles by Tim McGraw". Riaa.com. Retrieved 2011-08-05. ^ "RIAA Gold and Platinum Search for singles by Jason Aldean". Riaa.com. Retrieved 2011-08-05. ^ "RIAA Gold and Platinum Search for singles by Nicki Minaj". Riaa.com. Retrieved 2011-08-05. ^ "RIAA Gold and Platinum Search for singles by Ne-Yo". Riaa.com. Retrieved 2011-08-05. ^ "RIAA Gold and Platinum Search by Artists". Riaa.com. Retrieved 2016-12-14. ^ "RIAA Gold and Platinum Search for singles by Demi Lovato". Riaa.com. Retrieved January 6, 2016. ^ "RIAA Gold and Platinum Search for singles by Rascal Flatts". Riaa.com. Retrieved 2011-08-05. ^ "RIAA Gold and Platinum Search for singles by Fall Out Boy". Riaa.com. Retrieved 2011-08-05. ^ "Diamond Awards". RIAA. Retrieved 2015-12-17.